A day after hundreds of thousands of spectators lined San Francisco's Market Street to watch the city's 40th annual Gay Pride Parade, the U.S. Supreme Court on Monday sided with a San Francisco-based public law school's refusal to recognize or fund a Christian student group that refused to admit gays and non-Christian religious believers as members. 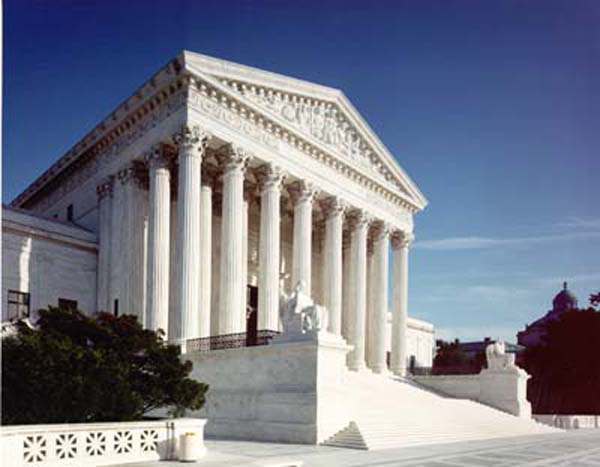 On the final day of its 2009-10 term, the justices, in a sharply-divided 5-4 decision, ruled that the Christian Legal Society could not expect to receive official recognition or funding from the University of California's Hastings College of the Law if it refused to comply with the school's anti-discrimination policy. The justices declared that the First Amendment did not require the public college to sanction the private group's membership policies based on its religious beliefs. While the court did not explicitly say so, its ruling strongly implied that granting such sanction would have violated the constitutional wall of separation between church and state. Writing for the court majority, Justice Ruth Bader Ginsburg rejected claims by the Christian Legal Society that the law school's anti-discrimination policy violated its First Amendment right to the free exercise of its religious beliefs and freedom of association. To the contrary, Hastings' anti-discrimination policy "ensures that no Hastings student is forced to fund a group that would reject him or her as a member," Ginsburg wrote. "It is the CLS's conduct, not its Christian perspective, [that] is, from Hastings' viewpoint, what stands between the group" and recognition by the law school. "In requiring the CLS -- in common with all other student organizations -- to choose between welcoming all students and forgoing the benefits of official recognition, we hold, Hastings did not transgress constitutional limitations," Ginsburg wrote. Colleges and universities, both public and private, fund student groups through activity fees directly charged to students, in addition to their tuition, room and board, and other expenses. For student groups at Hastings to receive official recognition and funding from the school, they must be open to all students, without regard to race, ethnicity, religion, gender, disability or sexual orientation. Ginsburg -- who read the majority opinion in the court's chamber even as she was mourning the death Sunday of her husband, Martin Ginsburg, from complications of metastatic cancer at the age of 78 -- was joined by Justices Anthony Kennedy, Stephen Breyer, Sonia Sotomayor and -- on his last day before his retirement -- John Paul Stevens. The Hastings College of the Law currently recognizes about 60 student groups, including the Hastings Association of Muslim Law Students, the Hastings Catholic Law Students Association, the Black Law Students Association, the Hastings Jewish Law Students Association and even Hastings OutLaw, a group formed by Hastings students who are openly gay. All have provisions in their bylaws, as required under the school's nondiscrimination policy, that membership is open to any full-time student at Hastings, but the Christian Legal Society is the only student group at Hastings that requires its members to strictly adhere to its religious principles. The CLS, a nearly half-century-old, Illinois-based national organization with chapters on 40 college campuses across the country, effectively bars gay men, lesbians and bisexuals from membership by requiring that all its members and officers affirm its "Statement of Faith," which includes the belief that "Christians should not engage in sexual conduct outside of a marriage between a man and a woman." A resolution passed by the CLS board was even more explicit: "Unrepentant participation in or advocacy of a sexually immoral lifestyle is inconsistent with an affirmation of the Statement of Faith," the resolution said. "We condemn all acts of sexual conduct outside of God's design for marriage between one man and one woman, including fornication, adultery and homosexual conduct." The group's "Statement of Faith" also effectively bars non-Christian believers by explicitly stating that "all officers, directors, members, advisory council members, and staff of CLS shall, as a condition of their employment or membership in CLS, acknowledge in writing their acceptance of . . .the Deity of our Lord, Jesus Christ, God’s only Son, conceived of the Holy Spirit, born of the virgin Mary; His vicarious death for our sins through which we receive eternal life; His bodily resurrection and personal return." In a concurring opinion, Justice Kennedy wrote that the CLS's Statement of Faith amounted to a "loyalty oath" reminiscent of the kind that was imposed on federal government agencies during the Cold War era by President Harry Truman. "The era of loyalty oaths is behind us," Kennedy wrote. "A school quite properly may conclude that allowing an oath or belief-affirming requirement, or an outside conduct requirement, could be divisive for student relations and inconsistent with the basic concept that a view's validity should be tested through free and open discussion." In his final opinion before stepping down, Justice Stevens wrote that while the CLS is free under the First Amendment to determine who can and cannot be members, a public university is not required by the First Amendment "to validate or support" the group's "discriminatory" practices. "Other groups may exclude or mistreat Jews, blacks and women -- or those who do not share their contempt for Jews, blacks and women," Stevens wrote. "A free society must tolerate such groups. It need not, however, subsidize them, give them its official imprimatur, or grant them equal access to law school facilities." In a hard-hitting dissenting opinion, Justice Samuel Alito blasted the court majority, denouncing their ruling as "a serious setback for freedom of expression in this country." Writing for the court's four conservatives, Alito cited the long-held judicial principle that "we protect the freedom to express 'the thought that we hate.' Today's decision rests on a very different principle: No freedom for expression that offends prevailing standards of political correctness in our country's institutions of higher learning." Alito's opinion was co-signed by Justices Antonin Scalia, Clarence Thomas and Chief Justice John Roberts. The CLS -- backed by the Alliance Defense Fund, one of several conservative groups defending California's Proposition 8, which bars same-gender marriage -- issued a defiant statement in response to the high court's ruling, insisting that Hastings' anti-discrimination policy was "unusual," that the court "confined its opinion to the unique policy" and that the justices "did not address" whether other public colleges and universities with similar nondiscrimination policies are free to enforce them. "All college students, including religious students, should have the right to form groups around shared beliefs without being banished from campus," Kim Colby, senior counsel at the CLS's Center for Law & Religious Freedom, said in the statement. "Today’s ruling, however, will have limited impact. We are not aware of any other public university that has the exact same policy as Hastings." Gregory Baylor, senior legal counsel at the Alliance Defense Fund, said the ruling "doesn’t settle the core constitutional issue of whether nondiscrimination policies in general can force religious student groups to allow non-believers to lead their groups. The conflict still exists." In the long run, Baylor said, the decision "puts other student groups across the country at risk." Baylor insisted that the Hastings policy "actually requires CLS to allow atheists to lead its Bible studies and the College Democrats to accept the election of Republican officers in order for the groups to be recognized on campus. We agree with Justice Alito in his dissent that the court should have rejected this as absurd." Baylor's argument was flatly rejected by the Reverend Barry Lynn, executive director of Americans United for the Separation of Church and State. "Religious discrimination is wrong, and a public school should be able to take steps to eradicate it," Lynn told The Associated Press. "Today's court ruling makes it easier for colleges and universities to do that. It's a huge step forward for fundamental fairness and equal treatment." A Delayed Return (for 24 Hours) . . .